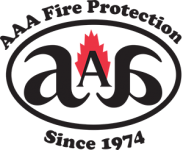 AAA Fire Protection Services is a family owned business with over 40 years of experience providing Danville businesses and businesses throughout the San Francisco Bay Area with comprehensive fire protection services. We make it easy for your business to stay in compliance with California fire code. Our comprehensive services include fire sprinkler services. Our fire sprinkler services include fire sprinkler installation. We work with your design team to understand the unique needs of your building and your business and then we design a fire sprinkler system that provides the best fire suppression capabilities. In addition to fire sprinkler installation, we provide fire sprinklers inspections that help us to identify faulty sprinklers and low water flow situations. Our fire sprinkler repairs help to bring your system back online and to maximize fire suppression capabilities. Our services are affordable, yet comprehensive. After 40 years of helping businesses just like yours, we understand how to provide the best systems at affordable prices. To learn more about our fire suppression systems and what we can do for your business, just give us a call at (800) 543-5556.